As it turns out, winning the Garbanzo DH requires a little bit of superstition and going as fast as you can. Marcelo Gutierrez woke up on Garbanzo DH race day and put his right foot on the floor. He admits, somewhat reluctantly, that he's a bit superstitious — but most racers are. Breakfast was a smoothie and toast with honey, and cinnamon that he brought from his home in Colombia. He travels with his favorite foods, but says he's cut back from the half-suitcase load per trip that he used to bring along. He did a couple of morning recon runs on his favorite track and then fulfilled media obligations before heading back to his room to rest up for the race. He would've rather rolled back to the lift and ripped laps in the bike park for the rest of the day — this is Whistler, after all — but saving energy for the 12-and-a-half minutes of flat-out charging of Garbanzo DH was more important. Distractions are everywhere in this place, and Marcelo had to do his best to keep his eyes on the prize — even requesting that we talk to him after his practice runs rather than on the lift en route to his race run. He wanted our chat to be conversational and human instead of monosyllabic and robotic. Before his race run, Marcelo warmed up with something that could best be described as something resembling a tribal dance. He says other riders laugh at him sometimes, but he doesn't mind. It's a pre-race routine designed to get his entire body ready. And then he prayed. He did some "pushups" on his handlebars. He grabbed his goggles. He breathed deep conscious breaths. And then, 10 or 15 seconds before his start, he smiled and told himself, "Okay dude, we're going to enjoy this. It's going to be good. Just let it go — and go as fast as you can." 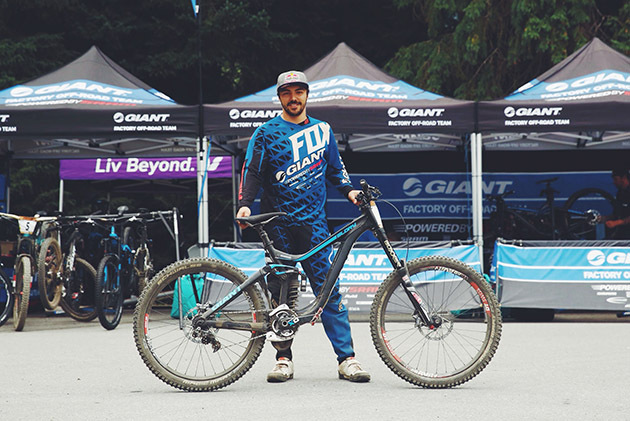 For the next 12 minutes and 24 seconds, the Giant Factory Team rider did exactly that, and "as fast as you can" was faster than anyone else.